Howard H. Keller, 67, of Meadowlark Road in Fredonia died Friday, November 5, 2004 at the Calumet Medical Center in Chilton, Wisconsin. He was born June 12, 1937 to John and Laura Schmeiser Keller in Green Bay, Wisconsin. He attended and graduated from Brillion High School. Howard met Kay Vanderhoof of Brillion and they were married November 6, 1954 in Chilton, Wisconsin. They started a family and moved to Port Washington in the late 1950’s. In the late 1970’s he started a printing company, Heritage Publishing, with his wife in Port Washington. In 1971 when the Port Washington Lions Club was chartered, Howard became a charter member. A very active member he held many of the club offices and held positions within the state as well. Of all the offices he held, his family said he enjoyed being Tail Twister the most. He recieved a Melvin Jones Fellowship in recognition of his commitment to Lions and his service. Howard enjoyed hunting and woodworking. He also liked to take trips on his motorcycle. With his wife Kay he toured the country and most recently went to Canada with his family. On local trips he had a very special riding buddy. His daughters yellow lab, Buddha. He is survived by his wife Kay, children Kim (Diane) Keller of Belgium, Steven Keller of Northern Wisconsin and Krys Keller of Fredonia. He was a proud grandpa of James, Shannon, Natalia, Christie and Michael and great grandpa of Ashlee. Further survived by brother Earl (Jean) Keller of San Luis Obispo, California, step brothers Lester (Janet) Keller and Walter (Lois) Keller both of Forest Junction, Wisconsin, step sisters Dorothy Bosserman of Oshkosh, Wisconsin and Florence Ennepper of Brillion Wisconsin, his buddy Buddha, other relatives and friends. The Rev. Allan Sommer will officiate funeral services 7 pm Tuesday, November 9, 2004 at the Poole Funeral Home. Cremation with final interment in St. Mary’s Cemetery. Visitation from 4 – 7 pm Tuesday at the funeral home. 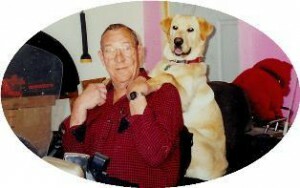 Memorials to Wisconsin Lions Camp or Leader Dog appreciated.